Richard Drueke and Toni Wurzburg Viertel contributed to this family history. Niederhelden, 1853-1871. Peter Wilhelm Drueke was born January 18, 1853, in Niederhelden, in the county of Olpe, or Kreis Olpe, 58 miles east of Cologne, or Köln. Niederhelden, which is in postal code 57439, is 2 miles southwest of the Lenne River, just south of the Ebbe mountains, or Ebbegebirge, in a chain of hills called the Sauerland. The county of Olpe is in the Federal State of North Rhine-Westphalia, or Nordrhein-Westfalen. North Rhine and Westphalia were combined into one state after World War II. When Peter Wilhelm lived in Niederhelden, it was part of Prussia, which acquired Westphalia at the Congress of Vienna in 1815. 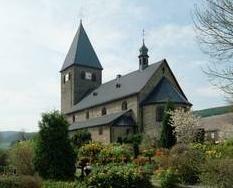 St. Hippolytus Church, Helden, Kreis Olpe, North Rhine-Westphalia. Peter Wilhelm was baptized on January 19, 1853, at St. Hippolytus Church in Helden, which is one mile west of Niederhelden. His godfather was Peter Göbel, a farmer from Niederhelden. His godmother was Bernardina Pulte Sauer, wife of Everhard Sauer from Jäckelchen, 2.5 miles south of Niederhelden. William Peter, as he became known, was the last of seven children of Wilhelm and Bernardina Heller Drüeke. His parents were married in Niederhelden in 1833 and had their seven children over 20 years. His father previously had been married to Anna Maria Struck in 1827. She died in 1831, two months after giving birth to their second child, who died at birth. William Peter's brothers and sisters were: Maria Elisabeth Antonetta born in 1828, Klemens Franz Wilhelm Anton in 1833, Eberhard in 1835, Charlotte in 1838, Anna Maria Sophia Klementina in 1840, Anna Elisabeth in 1843, and Anna Sophia in 1846. Around the time that William Peter was born, two first cousins emigrated from Ostentrop, Germany, to Minnesota Territory. Based on the 1900 Census, Franz Carl (Charles) Drüecke emigrated in 1852 at age 26 and his brother Peter in 1853 at age 24. They purchased land in Chanhassen Township, Carver County, just west of what is now the Twin Cities of Minneapolis and St. Paul. Minnesota did not become a State until 1858. They each married girls from Luxemburg and raised their families on contiguous farms. Charles died in 1911 and Peter in 1907. On October 24, 1854, William Peter's father Wilhelm Drüecke died at age 61. William Peter was 19 months old. His mother Josephina Bernardina was only 42. In 1857, William Peter's brother Eberhard, age 22, emigrated to America, from Bremen to Castle Garden in New York on the ship C.J. Borgstedt, arriving on October 6. The 1907 history of St. Mary's Church in Grand Rapids, Michigan, lists Eberhard Druecke as one of the founding parishioners in 1857. Eberhard eventually moved to Milwaukee, where he married and raised a family and worked as a tanner. Eberhard died some time between 1900 and 1910. New York City, 1871-1873. In 1871, at age 18, William immigrated to the United States, most likely to New York City. In 1871, there were 37 states in the Union. Ulysses S. Grant was President of the United States. Nebraska was the last state admitted to the Union, in 1867. "Between decks" section of S.S. Thuringia passenger list upon arrival at Castle Garden in New York City on September 19, 1871, showing Wm. Druke, 18, locksmith. William left Hamburg September 6 on the Hamburg America Line steamship Thuringia and arrived in New York at Castle Garden on September 19 after a voyage of 13 days. He was a "between decks" passenger and was listed as a locksmith. S.S. Frisia, sister ship of S.S. Thuringia, 1872. The Thuringia was an iron ship with one funnel and two masts that were rigged for sail. It had a speed of 12 knots. It was a 3,133 gross ton ship, length 350.3 feet, beam 40 feet. It was launched May 18, 1870, and laid up in 1875 and sold to the Russian Navy in 1878. Cabin Class section of S.S. Thuringia passenger list upon arrival at Castle Garden in New York City on September 19, 1871, showing Anna Drucke, 24. Cabin Class section of S.S. Thuringia passenger list upon arrival at Castle Garden in New York City on September 19, 1871, showing Fr. Wurzburg, 39, merchant, and five children: Emma, 14, Caroline, 15, Minna, 7, Friedr., 5, and Wm., 3. With William Peter on the Thuringia in 1871 were his sister Anna Sophia Drueke, 25, her fiancé Frederick William Wurzburg, 39, and Frederick's five children age 3 to 14. Anna Sophia and Frederick's family were cabin passengers. Frederick had married Augusta Heller in 1856, but Augusta died in 1870. In June 1871, Frederick appiled for a passport for himself and his children to go to Germany. Frederick William Wurzburg had immigrated from Helden to New York in 1847 at age 14, arriving in Baltimore on September 9. He had come with his brother Peter, 24, and sister Anna Catharina, 26. Peter eventually became a shoemaker in Grand Rapids. In 1854, two more brothers of Frederick came to the United States: Frank, 29, to Grand Rapids, where he was a clothes cutter, and John, 25, to New York City, where he was a shoemaker. Frederick became a dry goods retailer in New York City. In 1856, Frederick married Augusta Heller, and they had five children before Augusta died in 1870. In 1871, Frederick brought Anna Sophia Drueke and her brother William Peter Drueke from Niederhelden to New York City, where he had a dry goods store in East Harlem on the southwest corner of Third Avenue and 120th Street at 2198 Third Avenue. Frederick married Anna Sophia Drueke in New York and remained there for two years before moving to Grand Rapids, Michigan. William Peter Drueke probably lived in New York also before moving on to Grand Rapids. Grand Rapids, 1873-1882. In 1873, at age 20, William moved to Grand Rapids, Michigan, probably with his sister and her husband. Frederick W. Wurzburg was last listed in the New York directory in 1872 and first listed in the Grand Rapids directory in 1873. William Peter Drueke was never listed in the New York directory and first listed in the Grand Rapids directory in 1873. In 1875, he was listed in the Grand Rapids directory on the west side of the Grand River at 38 Summer Street, which was the same address as Frederick and Anna Sophia Drueke. Frederick started a department store, F. W. Wurzburg, in Grand Rapids. Frederick and Anna Sophia had five children prior to her death in 1884. In the 1875 directory, William Peter listed as was a clerk for William Hake, a wholesale wine and liquor dealer on the east side of the Grand River at 68 Canal Street. In 1876, William Drueke was promoted to traveling agent for William Hake. Ad in 1867 Grand Rapids directory for William Hake, Wholesale Dealer in Foreign and Domestic Wines and Liquors, Agency of Trans-Atlantic Steamers, Sailing Ships, and Foreign Exchange Office, 48 Canal Street, Grand Rapids, Mich. 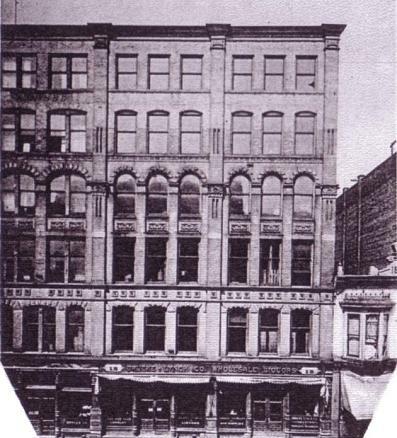 In 1877, the Hake business moved to a new 60x95 building on the east side of the Grand River at 39-43 E. Bridge Street, to be known as the Hake Block (107 Michigan Street NW after 1912). William Hake, like William Drueke, was from Westphalia. He was born in 1828, immigrated in 1847, and started his liquor business in 1859. 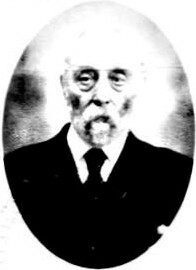 William Hake was also the local agent for the Hamburg America Line, whose steamship Thuringia brought William Drueke to America in 1871. The 1907 history of St. Mary's Church in Grand Rapids, Michigan, lists William Hake as one of the founding parishioners in 1857. The 1880 census shows William Peter living with Frederick and Anna Sophia Drueke Wurzburg on Summer Street. In 1880, William Peter's first cousin, once removed, Charles Drueke, emigrated from Ostentrop, Germany, to America. This is the year given for Charles' immigration in the 1900 census. 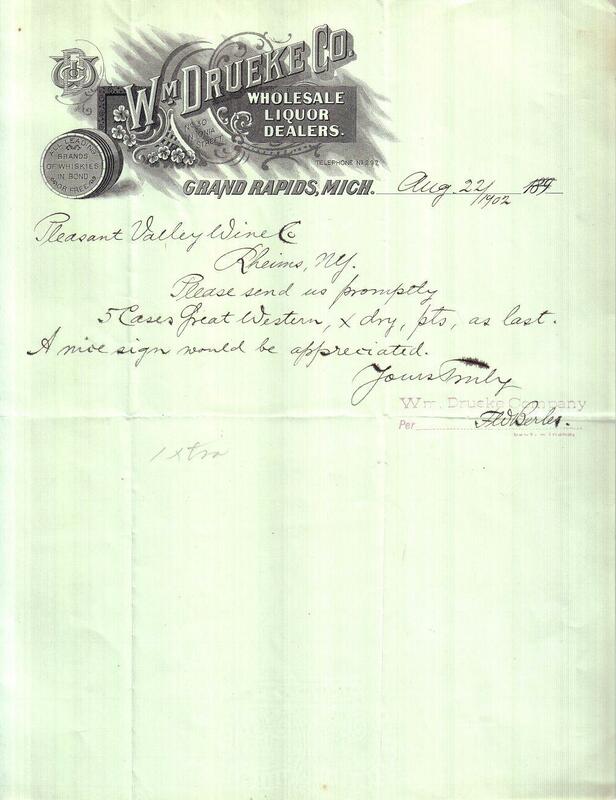 The Grand Rapids directory for 1883 shows Charles as a clerk in William Peter's liquor business, Drueke & Kennedy. Charles arrived in New York as Carl Drueke on October 12, 1880, from Hamburg, Germany, by way of Le Havre, France, on the ship Herder owned by the Hamburg America Line. He was listed as age 23 and from Prussia. Church records show that he was born Carl Ferdinand Drueke on March 29, 1857. Charles was a great grandson of Johann and Elisabeth Bitter Drüecke. William Peter was a grandson. Ostentrop, where Charles grew up, is eight miles from Helden, where William Peter grew up. Charles was age 14 when William Peter left Germany at age 18 in 1871. Grand Rapids, 1858-1882. Elizabeth Berles was born January 13, 1858, in Grand Rapids, Michigan. In 1858, there were 31 states in the Union. James Buchanan was President of the United States. California was the last state admitted to the Union, in 1851. Elizabeth was the third of eight children born to Franz and Regina Green Berles. Her parents were married in Detroit in 1851. Elizabeth's father, Franz Berles, immigrated in 1844 from Dorlar, Westphalia, Germany. Dorlar is 17 miles northeast of Helden. 1874 Grand Rapids Directory ad for the grocery store owned by Franz Berles. The family lived over the store. Franz Berles owned a grocery store in a building on the west side of the Grand River called the Berles Block, where the family also lived. The Berles Block was on the northeast corner of Bridge Street and Turner Street, at 57 W. Bridge Street (347 Bridge Street NW after 1912). The Berles Block was on the site of what is now an expressway, US 131. In the same block as the Berles Block was William Koch's undertaker business at 45 W. Bridge Street (335 Bridge Street NW after 1912). In 29 years, William and Elizabeth's son Will would marry the Koch's granddaughter Rose. Elizabeth's mother, Regina Green Berles, was born in Schönholthausen, Westphalia, about 16 miles west of Dorlar. Regina immigrated to the United States in 1846 at age 14. Elizabeth's paternal grandparents were Adam and Theresa Knoche Berles. Adam was from Dorlar and Theresa was from Altenilpe, 2.5 miles east of Dorlar. Adam died June 1, 1858, less than five months after Elizabeth was born. Around 1875, Theresa immigrated to the Unites States with her son Anthony Berles, brother of Elizabeth's father Franz Berles. Elizabeth's maternal grandparents were John and Anna Maria Spiekermann Green. They were from Schönholthausen and immigrated with their daughter Regina in 1846. 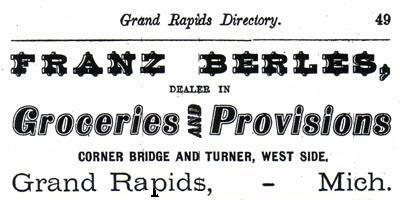 The 1867 Grand Rapids directory showed John Green in partnership with Franz Berles. From 1873 to 1880, at age 15 to 22, Elizabeth was listed in the Grand Rapids directory as a milliner or dressmaker. The 1873 directory showed her as a milliner for Mrs. G. V. French. 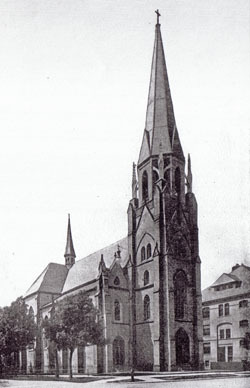 St. Mary's Church, 1907. 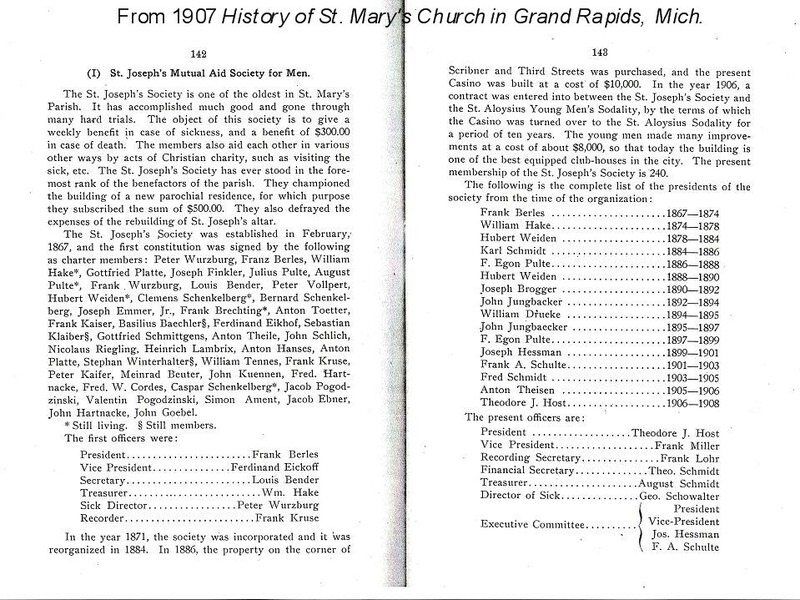 Source: History of St. Mary's Church in Grand Rapids, Mich., 1907. William Peter Drueke, 29, and Elizabeth Berles, 24, were married on November 23, 1882, at St. Mary's Church. Father John George Ehrenstrasser performed the ceremony. Witnesses were William's brother-in-law, Frederick William Wurzburg, and Laura Gobel. St. Mary's Church was built in 1873 by Father Ehrenstrasser, who became pastor in 1870. The parish was formed in 1857 to serve the German immigrants of Grand Rapids. Among the names of the 33 charter families were Berles, Hake, Hauser, Koch, and Wurzburg. Grand Rapids, 1882-1926. After the wedding, William and Elizabeth lived for a couple years at the Berles Block at 57 W. Bridge Street (347 Bridge Street NW after 1912). In 1883, after working for William Hake for seven years, William Peter Drueke started his own wholesale liquor business with Alexander Kennedy, Drueke & Kennedy, on the east side of the Grand River at 25 Canal Street (now Monroe Avenue NW, north of Pearl). After a year at 25 Canal Street, the business was located at 76 N. Waterloo Street (now Monroe Avenue NW, between Fulton and Lewis), still on the east side of the river. The bookkeeper for Drueke & Kennedy from 1883 to 1887 was John Green. John's wife, Josephine Berles Green, died in 1879. Josephine was the youngest sister of Franz Berles, father of Elizabeth Berles Drueke. William Peter's second cousin, Charles Drueke, worked as a clerk for the first three years after Drueke & Kennedy was started, then as a traveling agent. 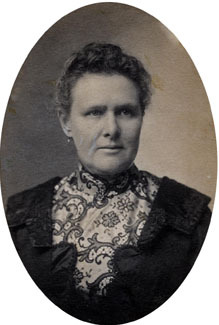 On August 10, 1883, William Peter's sister, Charlotte Drueke Vogt, 45, and her husband Joseph of 21 years arrived in Grand Rapids from Helden, Germany, with their eight children. They arrived on the ship Rhynland from Antwerp to castle Garden. They lived at 74 Summer Street (226 Summer Avenue NW after 1912). This was just down the block from William Peter and Charlotte's sister, Anna Sophia Drueke Wurzburg, at 107 (135 Summer Avenue NW after 1912). On October 7, 1883, William and Elizabeth had their first of their eight children, William Francis. On March 1, 1884, William's sister, Anna Sophia Drueke Wurzburg died at age 37. She was buried in Mt. Calvary Cemetery. She was survived by her husband of 13 years, Frederick William Wurzburg, and five children, one of whom, Francis Lewis, would become publisher of Cosmopolitan in New York City. A child of Francis Lewis Wurzburg, Elinor Craw Wurzburg, would marry William Van Duzer Lawrence, grandson of the founder of Sarah Lawrence College in Bronxville, New York. On August 2, 1884, Elizabeth's father Franz Berles died at age 56 of "Bright’s Disease of the heart." Elizabeth's brother Frank Berles continued to run the Berles grocery store, with Adolph Wurzburg, under the name Berles & Wurzburg. Adolph was a nephew of William Peter's sister, Anna Sophia Drueke Wurzburg. He was the son of Peter Wurzburg. In 1885, William's brother-in-law, Frederick William Wurzburg, 52, married Theresa, 35, and they had five children. In 1886, William Peter and Elizabeth had their second child, Antoinette. That same year, they moved from the Berles Block a half mile south to 122 Summer Street (116 Summer Avenue NW after 1912). This was just down the street from William's sister, Charlotte Drueke Vogt, and her husband Joseph Vogt, at 74 Summer Street (226 Summer Avenue NW after 1912), and William's brother-in-law, Frederick William Wurzburg, at 107 (135 Summer Avenue NW after 1912). From 1886 to 1888, Elizabeth's brother, John A. Berles, worked as a salesman and clerk for Drueke & Kennedy. John died at 36 on January 29, 1891. 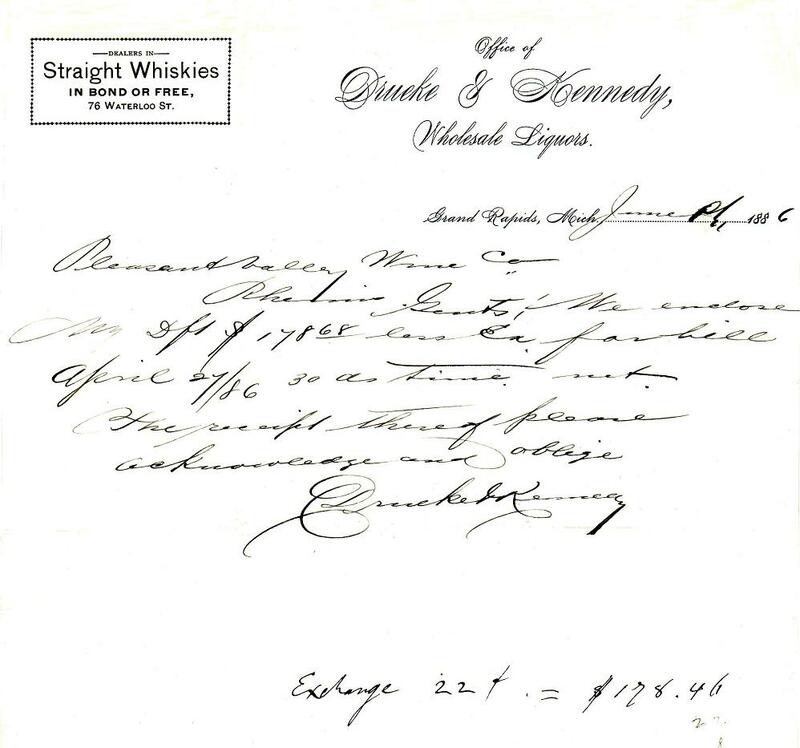 Letterhead for "Office of Drueke & Kennedy, Wholesale Liquors," 1983-1888. Taken from a letter purchased on eBay in 2007 with the assistance of William Biggins. The letter, dated June 1886, was written to the Pleasant Valley Wine Co., Rheims, New York. On September 3, 1886, William and Elizabeth had their third child, Francis Xavier. On March 17, 1887, William Peter's mother, Bernardina Heller Drüeke, died in Helden, Germany. She was 75. She had been a widow for 32 years. On June 7, 1887, Elizabeth's younger sister Josephine Berles, 21, married William Peter's first cousin, once removed, Charles Drueke, 29, at St. Mary's Church. Theu were married by Father Joseph Schwick, who became pastor in 1886. They lived in the Berles Block for the first 15 years their marriage. Charles had worked as a clerk in William Peter's liquor business from 1883 to 1885. From 1886 to 1897 he was a traveling agent. In 1898 and 1899, Charles operated a saloon with Jerome Trowbridge next door to the William Peter's liquor business on North Ionia Street. After that he is listed in the directories as a traveling salesman without mention of the firm name. The 1920 census lists him as a traveling salesman in the liquor business. Charles and Josephine Berles Drueke had two children: Arthur Karl, an accountant, and Marie Rose, who married Harry Langhoff and moved to Milwaukee. Letterhead for Wm. Drueke Co., after the move to Crescent Street in 1888. Taken from a letter dated August 23, 1889. The Michigan Tradesman for May 9, 1888, reported that William Peter Drueke and Alexander Kennedy had dissolved their partnership of the last five years. William Peter was taking stock and fixtures to 16 and 18 Crescent Avenue on the east side of the river, where he would continue business (Crescent once went through to Monroe; the business would have been on the southeast corner of Monroe and Crescent, roughly equivalent to 298 Monroe Avenue NW). William Peter's brother-in-law, Frederick William Wurzburg, had his department store on the northeast corner at 300-304 Monroe Avenue. The name of the business was changed to Wm Drueke from Drueke & Kennedy. Also, for the first time, the directory listed a Citizens Telephone Company number for the business, No. 297. Kennedy was staying at the old location where he would open up with new stock. 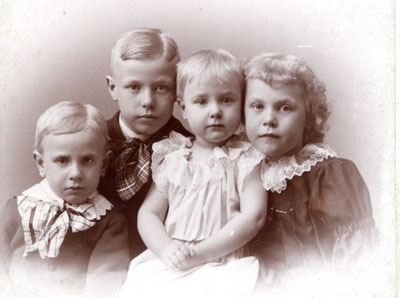 Drueke children, circa 1891. From left: Frank, 5; Will, 8; Louise, 2; and Antoinette, 6. In 1889, William and Elizabeth had their fourth child, Louise. The 1907 History of St. Mary's Parish in Grand Rapids, Mich., says that William Peter was on a five-man committee that built a new school for St. Mary's Church on Turner Street. The Grand Rapids Herald of February 22, 1892, says that William was one of the marshals of the procession of Catholic societies that celebrated the dedication of the new school that day. On June 30, 1892, William and Elizabeth had their fifth child, Bernice. On July 24, 1894, William and Elizabeth had their sixth child, Richard Karl. William Peter was president of the St. Joseph's Mutual Aid Society at St. Mary's Church in 1894-95. The first president was his father-in-law, Franz Berles, in 1867-74. The second president was his former employer, William Hake, in 1874-78. The original purpose of the Society was to provide members with a weekly sickness benefit and a $300 death benefit. The 1907 History of St. Mary's Church in Grand Rapids, Mich., reported that the Society had 240 members and its own building, called the Casino Club, near the Church at Third and Scribner streets. The Society continues to this day as the Casino Club with 600 members at 3260 Salerno Drive NE. In 1897, the Berles & Wurzburg grocery store went out of business. Upon the death of Franz Berles, the store had been taken over in 1884 by Elizabeth's brother Frank Berles and Adolph Wurzburg. Adolph was a nephew of William Peter's sister, Anna Sophia Drueke Wurzburg. In 1897, Elizabeth's mother, Mary Regina Green Berles, age 65, moved in with William and Elizabeth at 122 Summer Street. In 1897, William and Elizabeth had their seventh child, Edwin. In 1897, the business moved several blocks south and west to 30 N. Ionia Street (34 Ionia Avenue NW after 1912). The name of the business was changed to Wm. Drueke Company from Wm. Drueke. William Peter was listed in the directory as President. Elizabeth's cousin, Frank W. Berles, was listed as Secretary and Treasurer. Frank had been bookkeeper since 1895. "Please send us promptly 5 cases Great Western, x dry, pts, as last. A nice sign would be appreciated. Yours truly, Wm. Drueke Company, Per /s/FWBerles, Secy. & Treas." On July 28, 1898, William and Elizabeth had their eighth and last child, Clarence Anthony. In 1898, Charlotte Drueke Vogt’s son Englebert Vogt and son-in-law John Knape founded Knape & Vogt Manufacturing Co., a hardware manufacturing company that is still in existence today. Principal products are drawer slides and adjustable shelving. In 1901, at age 21, William Peter's son William Francis, after working as a traveling salesman for D. Lynch, went to work as a traveling salesman in his father's wholesale liquor business. Also in that year, the business added a second telephone, M 297. The second number was for Michigan Bell Telephone Company, which entered the market to compete with Citizens. In 1903, Elizabeth's sister Abigail Berles, 30, married Paul J. Hake, 28, the son of William Peter's first employer in the liquor business, William Hake. Paul was a graduate of the University of Notre Dame. In 1903, the Grand Rapids directory shows the business of Wm. Drueke Company as retail as well as wholesale. Also, Mathias Richard replaced Frank W. Berles, Elizabeth's cousin, as Secretary and Treasurer. Frank died May 3, 1904, at age 50. 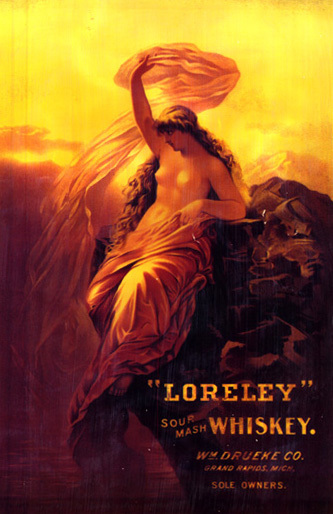 Loreley poster, 1897-1910, purchased by Peter Biggins on eBay in 2003 with the assistance of William Biggins. 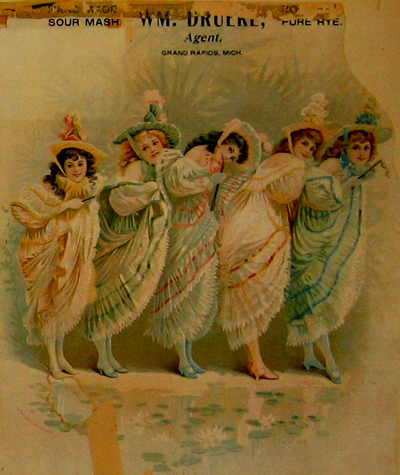 Poster with five maidens by a lily pond advertising sour mash and rye whiskey, Wm. Drueke, agent, 1889-1896, obtained by Mary Kay Drueke Groening from the Drueke Games office of her father, Wm. 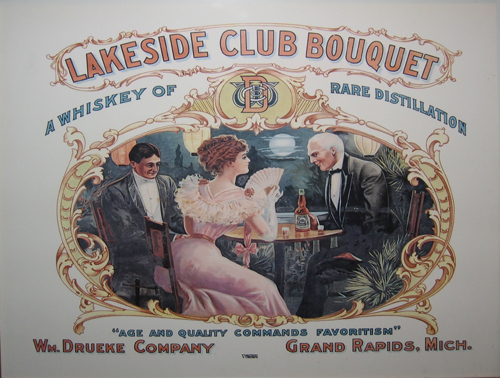 F. Drueke, Jr.
Lakeside Club Bouquet poster, 1907-1910, lithograph on Vitrolite. Size 20" x 17" Owned by Felix Pytlinske, Jr., of Felix's, Stearns Bayou, Grand Haven, Michigan. Lithographic copy obtained by Elizabeth Drueke. Trademark printed bottom center: "MEYERCORD CO. CHICAGO VITROLITE." Vitrolite was manufactured by Charles Rudolph Meyercord, organizer and president of the Vitrolite Company. The company manufactured Vitrolite in the factory in Parkersburg, West Virginia, from 1907 to 1937. Vitrolite was an opaque colored fire finished material. It was advertised as "Vitrolite-Better than Marble." Lakeside Club Bouquet Tip Tray, 4-1/2" diameter. Lithographed by Meek Co. of Coshocton, Ohio, 1901-1909. Shot glass for Lakeside Club Rye. 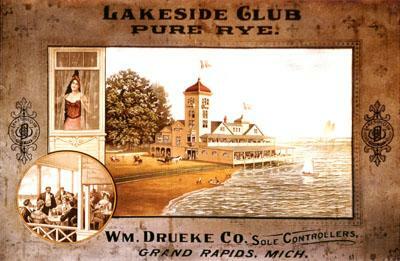 Height 2-1/4"
Lakeside Club poster, with picture of Lakeside Club at Reed's Lake in Grand Rapids, 1897-1910. Owned by Old San Francisco Steakhouse in Dallas, Texas (shut down in 2005 but poster is still there, per Paul at Paul's Porterhouse across the street). Discovered by Peter Biggins when he moved to Dallas in 1980. Photo by William Biggins in the 1980s. Touchup arranged by Mary Kay Drueke Groening. 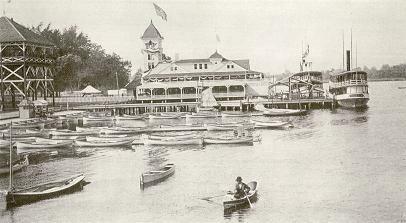 The Lakeside Club at Reed's lake, Grand Rapids, Michigan, 1896. From an angle 45 degrees different than the Drueke poster. With rowboats and sightseeing boats (the Hazel A and the Major Watson) instead of a beach. In 1905, Mr. and Mrs. William Drueke of 122 Summer Street, with their son William Drueke, Jr., were listed in the Society Blue Book for Grand Rapids. Also listed was Charles A. Hauser of 112 Gold Street, uncle of Rose Viola Smith. On June 4, 1906, Elizabeth's mother, Mary Regina Green Berles, died at age 72. She had been living with William and Elizabeth since 1897. 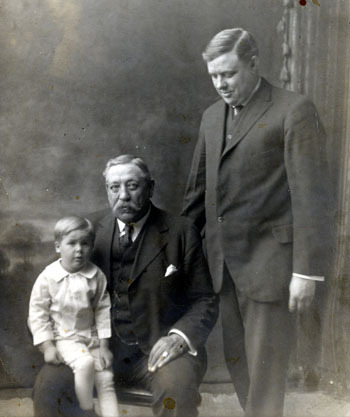 Three William Druekes in 1915: William Francis, 3; William Peter, 62, William Francis, 32. On June 28, 1906, William Peter's son William Francis, 22, and Rose Viola Smith, 24, were married at St. Mary's Church. In 1907, Henry Huber replaced William Peter as President of Wm. Drueke Company. William Peter became Vice President. In 1908, William Peter's son William Francis left his father's liquor business to become a traveling salesman for the Worden Grocery Co., wholesale grocers, importers and coffee roasters. Eventually, his son would start the Wm. F. Drueke & Co. a manufacturer of chess sets, backgammon, cribbage, and many other games. In 1909, William and Elizabeth's daughter Antoinette married George A. Matthews. George was a graduate of the pharmacy course of Ferris Institute of Big Rapids, Michigan, and became a partner in his father's drug business, the Matthews Drug Store at Broadway Avenue and 6th Street, NW. In 1910, based on the Grand Rapids directory listings, Wm. 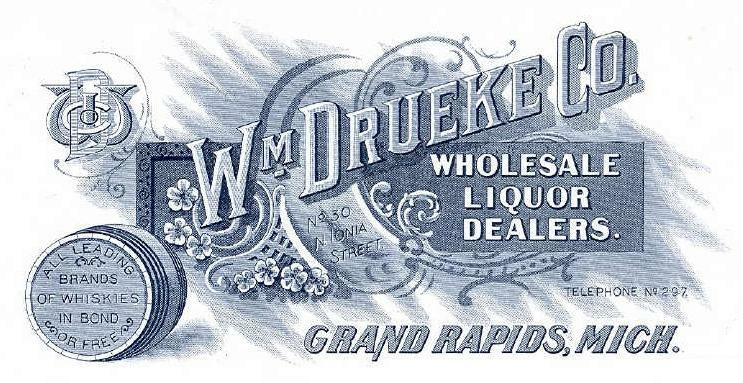 Drueke Company went out of the retail liquor business, but remained in the wholesale business. In 1911, the name of William Peter's company was changed from Wm. Drueke Company to Drueke-Lynch Co. Henry Huber was no longer president. The new officers were: C. H. Kahler, President; H. J. Hagaen and Wm. Drueke, Vice President; H. A. Brink, Secretary and Manager; F. J. Reilly, Treasurer. The business was moved a block south to 13-15 S. Ionia (13-15 Ionia Avenue SW in 1912), in a building known as the Blodgett Block. The building is still there. Advertisement on front cover of 1914 Grand Rapids City Directory. Drueke-Lynch Company letterhead, 1911-1918. Typewritten letter dated August 3, 1917, nine months prior to Michigan prohibition. 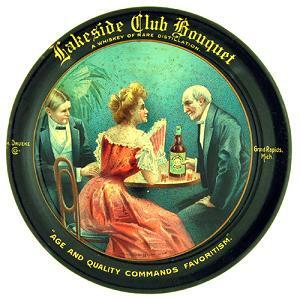 Above the fifth-floor windows in the drawing of the building is a sign, "Lakeside Club Whiskey." The artist took some liberties in drawing the building. The actual building had six bays of windows instead of three and Drueke-Lynch occupied two bays instead of three. The actual building had six stories instead of five. Storefront detail of Drueke-Lynch Co., Wholesale Liquors, 13-15 Ionia Avenue SW, Grand Rapids, 1911-1918. Sign reads: "Drueke-Lynch Co. Wholesale Liquors" with the street numbers "15" to the left and "13" to the right. Source: Grand Rapids Public Library. 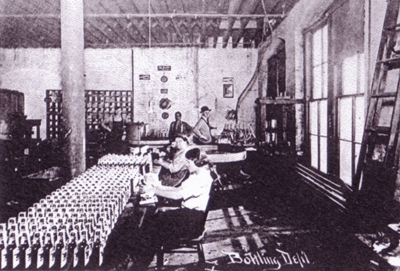 Drueke-Lynch "Bottling Dept." at 13-15 Ionia Avenue SW, Grand Rapids, 1911-1918. Source: Grand Rapids Public Library. 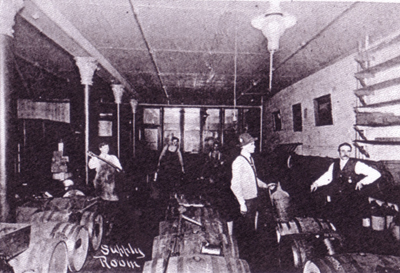 Drueke-Lynch "Supply Room" at 13-15 Ionia Avenue SW, Grand Rapids, 1911-1918. Source: Grand Rapids Public Library. 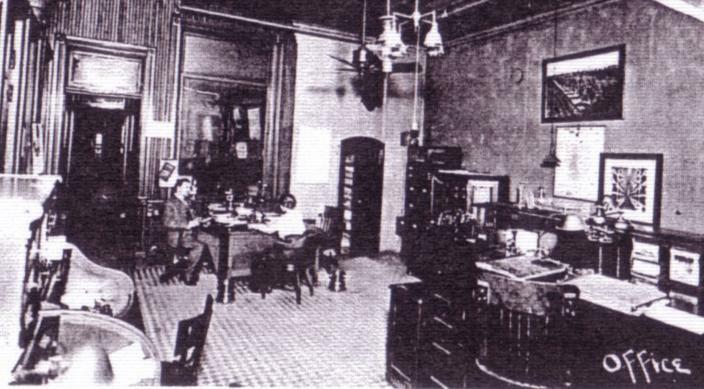 Drueke-Lynch "Office" at 13-15 Ionia Avenue SW, Grand Rapids, 1911-1918. Source: Grand Rapids Public Library. Northern third of Blodgett Building, 13-15 Ionia Avenue SW, Grand Rapids, 1911-1918. Sign over first floor store front reads: "Drueke-Lynch Co. Wholesale Liquors" with the street numbers "15" to the left and "13" to the right. Source: Grand Rapids Public Library. 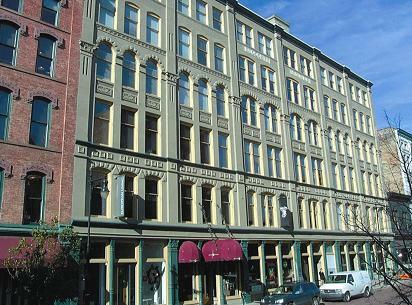 Owner since 1995, Sam Cummings, says the Blodgett Building was built in 1886 by Delos A. Blodgett, who was this area's most prominent lumber "baron." He, and later his family, built and endowed a home for children and the Blodgett Memorial Hospital. The building was built as an investment (he had several such real estate ventures around town) and was home to several area wholesalers/distributors/retailers. The area where the building is located (now the Heartside Historic District) was once the distribution center for all of West Michigan, as the railroad station was located just south of here. 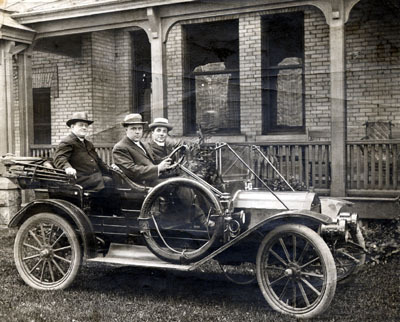 William Francis Drueke, 28, at steering wheel, and two unidentified persons, circa 1911, in his 1910 Flanders "20" Suburban in front of William Peter and Elizabeth Drueke's home at 122 Summer Street (116 Summer Avenue NW after 1912). In 1912, William Peter was listed as traveling agent rather than Vice President. In 1913, he was restored to Vice President in a new set of officers: Peter Hoek, President; Wm. Drueke, Vice President; H. J. Richer, Secretary and Treasurer. On April 23, 1913, William and Elizabeth's daughter Louise, 24, married Joseph J. Hesse, 24. They were married at St. Mary's Church by Father Joseph J. Vogel, pastor. Witnesses were Louise's brother Richard, 19, and Joseph's sister Mary, 17. Joseph was a rug merchant in the 1920 census. One of their children, Robert Hesse, was to become a priest and missionary. Since 1900, the temperance movement in the United States had placed increasing emphasis on legal prohibition rather than personal reform. By 1914, fourteen states had adopted prohibition laws. 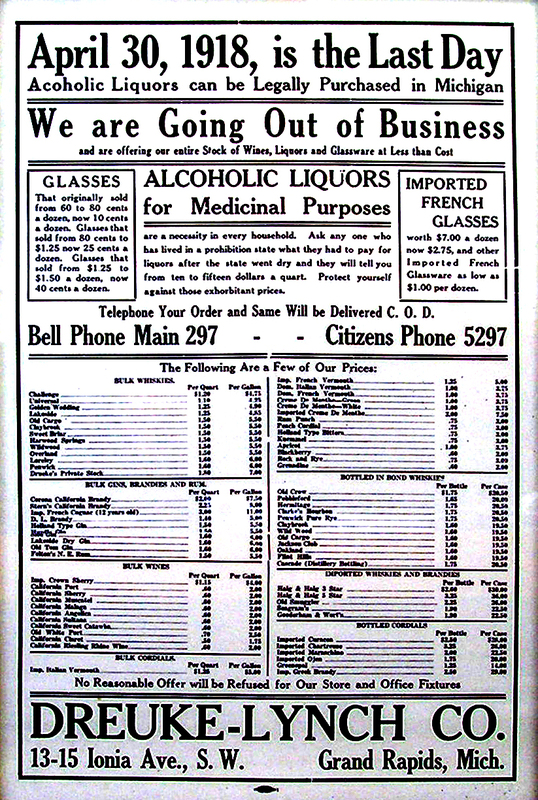 Many temperance advocates had opposed the extension of federal power necessarily involved in national prohibition, but with the outbreak of World War I, the Anti-Saloon League was able to win passage of various federal prohibitory laws as part of the war effort, either to protect the morals of servicemen or to conserve grain for nutritional purposes. Michigan passed a prohibition law that became effective May 1, 1918. The U.S. Congress had passed the 18th Amendment to the U.S. Constitution in 1917, but it was not to be ratified by the required three-fourths of states until January 16, 1919. In the meantime, the Michigan law became effective May 1, 1918. Telephone Your Order and Same Will be Delivered C. O. D.
13-15 Ionia Ave., S.W. Grand Rapids, Mich.
On February 18, 1919, more than nine months after the Michigan law had become effective, the Michigan Supreme Court held the law to be unenforceable. But, five weeks later, on March 27, 1919, the Volstead Act, also known as the National Prohibition Enforcement Act, gave the 18th Amendment some teeth. It clearly defined an alcoholic beverage as one with an alcoholic content greater than 0.5 percent. It was passed by the U.S. Congress on October 28, 1919 over the veto of President Woodrow Wilson. It went into effect with the Eighteenth Amendment on January 16, 1920. The principal effect of the Volstead Act was to extend the wartime measures to peacetime. In 1933, U. S. prohibition was repealed by the 21st Amendment. Michigan repealed its prohibition law at the same time. Junior Engineer on the President Arthur from Bremerhaven in 1923. The 1920 census shows Frank, 33, a marine engineer, and his wife Bertha, 23, born in New York, living in Bayside, Queens. Frank's nephew, William Drueke said Frank had left Grand Rapids as he had had a fight with his father and did not come back until his father died. In the 1914 Grand Rapids directory, Frank was listed as a traveling agent for Drueke-Lynch Co. When his father died in 1926, Frank was living in Brooklyn. A 1931 photo shows Frank and Bertha in Grand Rapids with his brothers Will and Clarence (see below). In the 1920 census, William Peter is listed as a commercial salesman of specialties. Frederick William Wurzburg, age 81. 1915 passport photo. In 1921, William Peter's sister, Charlotte Drueke Vogt, died in Grand rapids at age 84. Sometime after 1920, William and Elizabeth's daughter Bernice married Claude Cheney. Claude was listed in the 1920 census as a mechanic in a garage in Cedar Springs, Kent County, Michigan. Sometime between 1921 and 1924, William and Elizabeth moved four miles east and south to 1144 Alexander Street SE on the east side of the Grand River from 116 Summer Avenue NW on the west side of the river. On August 4, 1923, William and Elizabeth's son Richard, 27, died at their home on Alexander Street. Richard's 1918 draft registration showed him as a tool maker for the Western Michigan Machine Tool Co. In the 1920 census, Richard was listed as a machinist in a machine shop. On June 7, 1924, Fredrick William Wurzburg, 90, died suddenly at his home at 126 Paddock Avenue. Frederick was William Peter's brother-in-law who accompanied him and his sister when they immigrated on the steamship Thuringia in 1871. Frederick's death was reported on the front page of the Grand Rapids Herald. His Wurzburg's department store, at Monroe and Ottawa since 1949, would continue in existence until 1974. The store was torn down in 1977. A new Grand Rapids Art Museum was built on the site of the former Wurzburg's department store and opened in October 2007. 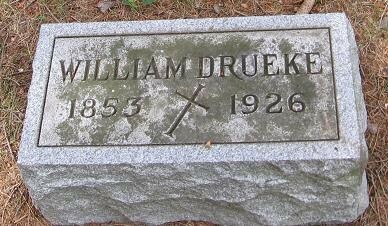 On April 11, 1926, after eight years of retirement, William Peter Drueke, died of cancer at age 73. He was survived by his wife Elizabeth and six of their eight children. He was buried at Mount Calvary Cemetery. William P. Drueke, 73, 1144 Alexander st., SE, a resident of Grand Rapids and well known throughout the state, died yesterday at his home after an illness of three months. Mr. Drueke was a member of the firm of Drueke & Lynch, liquor dealers, for 43 years. While engaged in that industry he traveled in all parts of the state. He was a member of the B. P. O. E., the Holy Name and Arbiter societies, and was connected with many charitable endeavors in the city. He is survived by his widow and the following children: three sons, William F., Jr., and Clarence of Grand Rapids, and Frank of Brooklyn, N. Y., three daughters, Mrs. George Matthews, Mrs. Joseph Hesse, and Mrs. Claude Cheney, all of Grand Rapids. Funeral announcements are to be made later. William Peter Drueke tombstone, Mount Calvary Cemetery. Grand Rapids, 1926-1941. With William Peter's death in 1926, Elizabeth was widowed after 44 years of marriage. 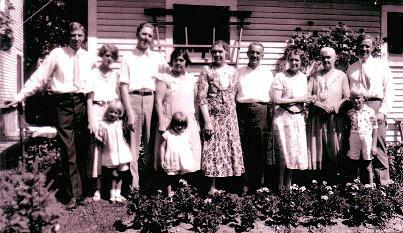 Three Drueke brothers, three Berles sisters, and families in the backyard of 120 Grand Avenue, 1931. 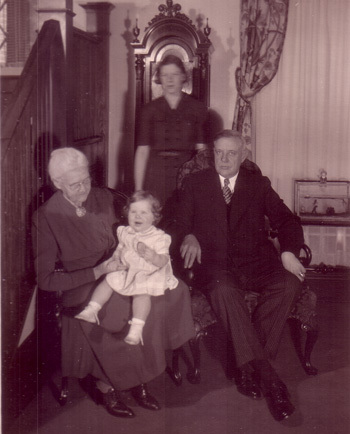 Adults, from left: Frank Drueke, 45, and wife Bertha Reidel Drueke, 35; Clarence Drueke, 33, and wife Elizabeth "Betty" Drueke; Josephine Berles Drueke, 65 (husband Charles had died in 1928); Paul Hake, 56, and wife Abigail Berles Hake, 59; Elizabeth Berles Drueke, 73 (husband William Peter had died in 1926); and Will Drueke, 48. Children of Frank and Bertha: Mary Louise Drueke, 4, standing in front of Bertha; Edwin Drueke, 7, standing in front of Will. The girl in the middle is unknown. Frank and Bertha Reidel Drueke and children were visiting from Long Island. In 1934, Elizabeth moved 1.5 miles northeast to 315 Woodmere Avenue SE. In 1936, she moved a half mile south to 645 Gladstone Drive SE. Elizabeth celebrated her 80th birthday on January 13, 1838. Her children gave a big party for her at the Peninsular Club in Grand Rapids. Emily Jane Biggins was born in Grand Rapids on November 9, 1938. Peter Alfred Biggins was born in Kalamazoo on November 8, 1939. Irene Drueke was born in Grand Rapids on June 18, 1940. James Alfred Biggins was born in Kalamazoo on July 15, 1941. Gretchen Griffin was born in Grand Rapids on November 2, 1941. 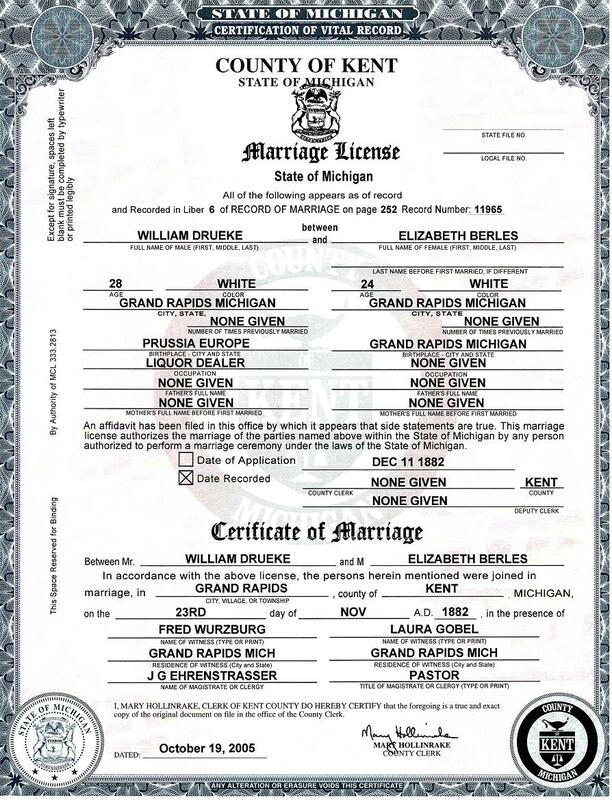 Elizabeth Drueke was born in Grand Rapids on December 27, 1941, the same day that Elizabeth Berles Drueke died. On December 27, 1941, Elizabeth Berles Drueke, died at age 83 in Grand Rapids. She had been a widow for 15 years. She was survived by six of her eight children, 18 grandchildren, and eight great grandchildren. 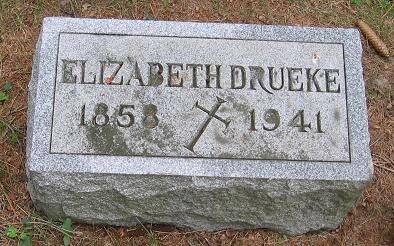 One of her great grandchildren, Elizabeth Drueke, was born on the day she died. Elizabeth Berles Drueke was buried next to her husband at Mount Calvary Cemetery. DRUEKE—Mrs. Elizabeth M. Drueke, aged 83, widow of William Drueke of 645 Gladstone ave., SE, passed away early Saturday morning at St. Mary's hospital. Surviving are three sons, William F. Drueke, Clarence of Grand Rapids and Frank X. Drueke of New York; three daughters, Mrs. George A. Matthews, Mrs. Joseph J. Hesse and Mrs. Claude J. Cheney; three sisters, Mrs. Charles Drueke, Mrs. Paul Hake of Grand Rapids and Mrs. Adolph Bodenstein of Streator, Ill.; 18 grandchildren, and eight great-grandchildren. Funeral services will be held Tuesday morning at 9 o'clock at St. Mary's church. Interment in Mt. Calvary cemetery. Friends will recite the Rosary Monday evening at 8 o'clock. Mrs. Drueke reposes at the Alt mortuary. Elizabeth Berles Drueke tombstone, Mount Calvary Cemetery. Clarence Anthony Drueke 1898-1963 m. 1931 Elizabeth A. "Betty"